Please remember that the Basilica, the most ancient of the three Doric monuments of the Archaeological Park, is the only architectural barrier-free Greek temple of the Mediterranean area. The visit lasts about one hour. Cilento is an ancient and wonderful territory. To participate, you must fill out the entry form and deliver it to the Guided Tours Secretary the day before the tour of your choice. 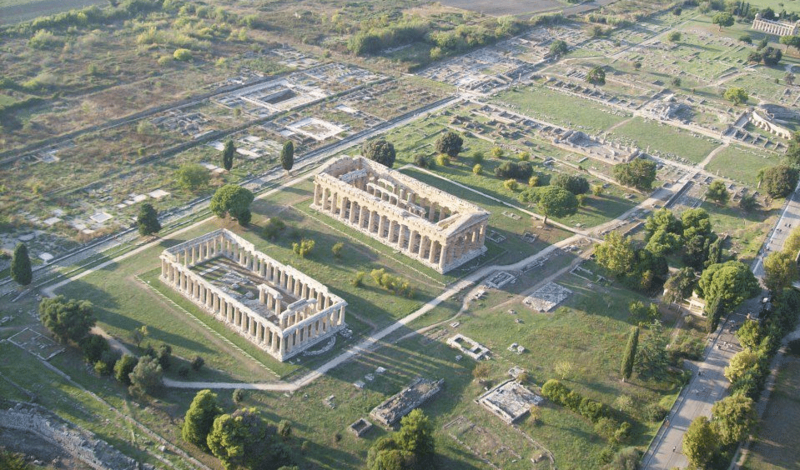 The Museum collects unparalleled reports coming from the city and the territory of Poseidonia-Paestum: prehistoric funerary equipment, recovered architectonic and sculpture rests in the diggings. Of great interest is the futile statue seated of Zeus from the 6 century. a.C., large feminine bust, the lacking the head, from the end of the 6 century a.C., the amphoras to hydria in bronze from the 6 century a.C.. 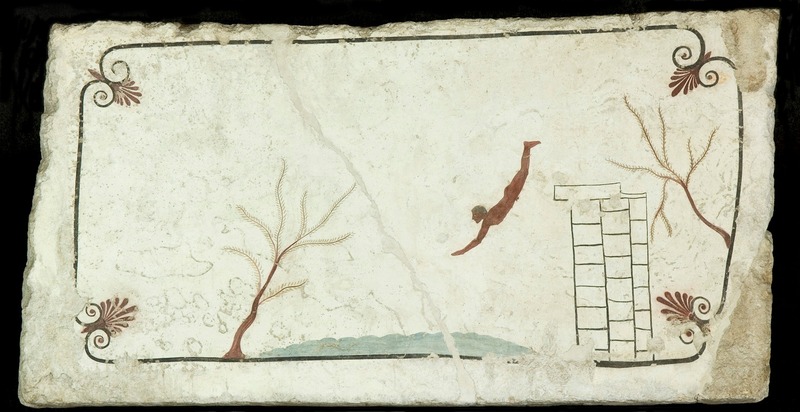 The painted slabs coming from some 120 tombs up to now recovered, between one of the most famous is the painted tomb of the Diver from 480 a.C.. Sculptures, marmoreal registrations, cult objects, fragments and amphoras are the testimony of the Roman Age in Paestum. Poseidonia was founded Greek colony to the end of the 7 sec. a.C. by the Sibariti. Conquered to the end of the 5 sec. a.C. by theLucani, in 3 sec. a.C. becameimposing temples are gilded, going back to the IV and V sec. 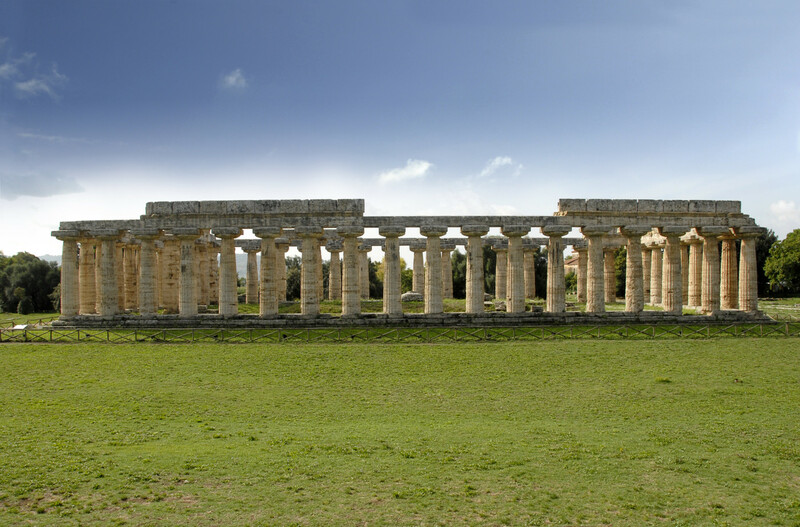 a.C.: the Basilica of Hera, the Temple of Neptune or Poseidon and the Temple of Cerere. 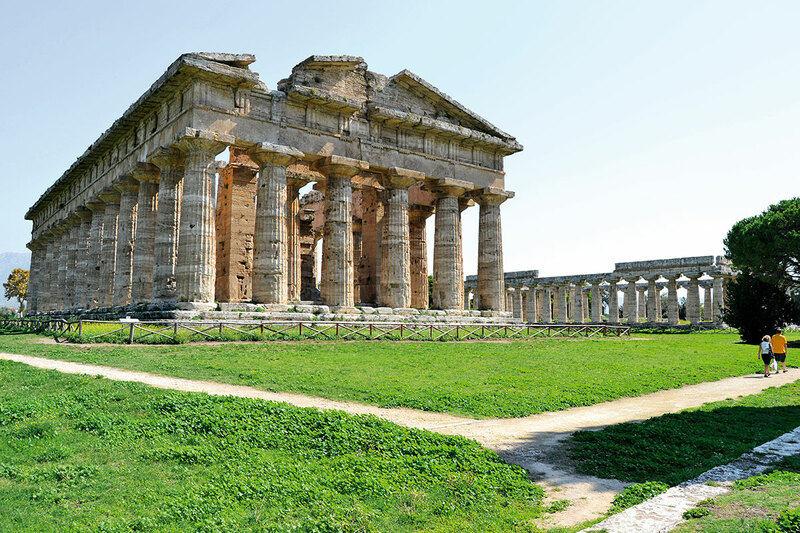 The Basilica is the most ancient of the Paestum temples: it rises solemnly, with the gilded columns of the arch, orienting to east. 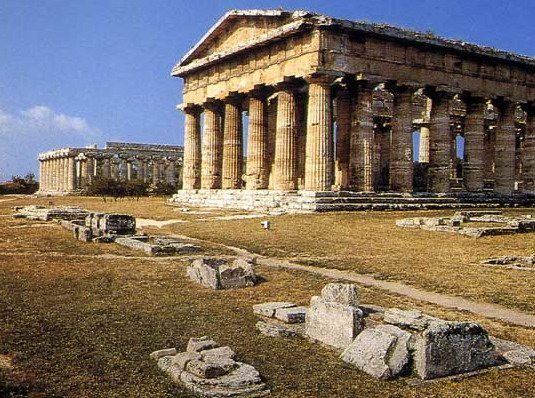 The most classic and perfect example of a Doric temple of the Greek world is surely Neptunes temple. To the northern extremity of the sacred zone the templeCerere rises, dedicated to Athena. The diggings regard an immense area of the city with other huge buildings like the thermes, the porch of the hole, the amphitheatre. 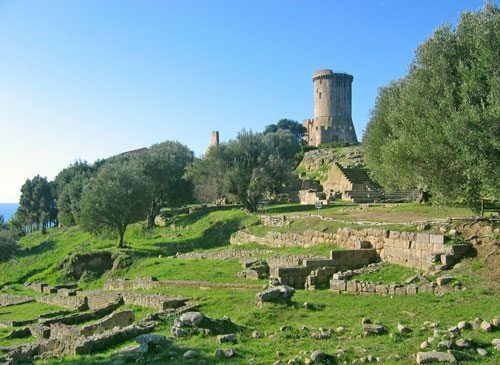 Velia, ancient Elea, was founded around540 a.C. by the Focei colonies which came fromAsia to battle Ciro’s army. Here Parmenide and Zenone were born and with the eleatica school, reference in the philosophical culture of the antiquity. In the modern remains the city system is obvious through which Door is approached through the imposing “rose” only example of Greek architecture with time all sixth. Pregevole is the wall of the sacred fencing with the charming stoà or porch, paved in bricks from the Hellenistic Ages. The site of Palinuro (Centola) is of particular interest in the intersection of cultures that have been setting and whose traces are found in the Antiquarium, located on the steep slope in Ficocella that offers visitors a picturesque view of the gulf. The building houses archaeological finds (ceramics and furnishings of obsidian of about six thousand years ago) found in the excavations, undertaken in the area of the town, which since 1948 have unearthed a necropolis of the sixth century BC The public can see exhibits of pottery imported Attic black-figure, and ion-decorated bands, the vessels also reflected a kind of local pottery decorated with geometric patterns reminiscent of whose elements from the island of Cyprus and those of ceramic Percenzia in northern Apulia dating from the late seventh century BC Dell’allestimento materials are also part of several burial from the necropolis, Enotrio type, of the San Paolo. A Roccagloriosa are exposed in two Antiquarian, finds evidences of Lucan (fourth century BC.) Found in the necropolis, with tombs “emerging”. In the first Antiquarian (former Church of St. Mary of the Martyrs), are exposed to, among others, the precious discoveries of the tomb n 9 (female burial), containing a rich array of jewelry, arrived intact, which testifies to the contacts with the productions Taranto and links with ancient Italian traditions. 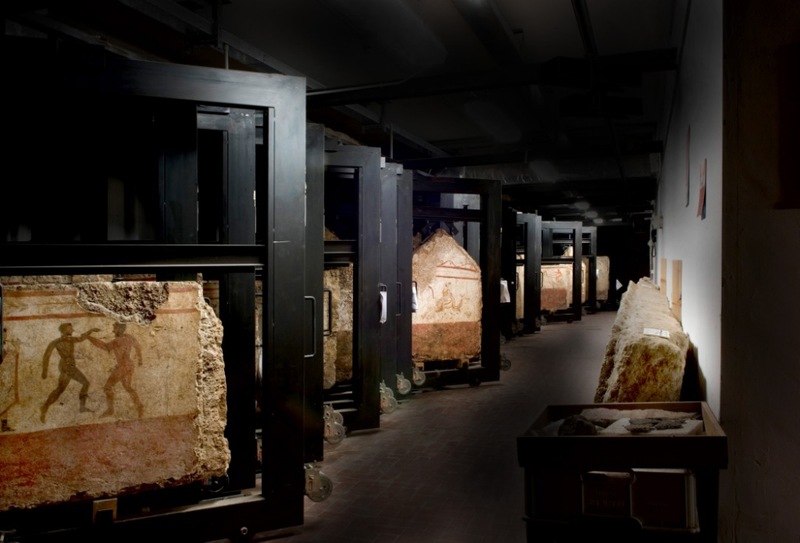 The second Antiquarian offers a photographic exhibition on the site of the Necropolis and the graves especially n 19 and 24, which also exhibits are on display. 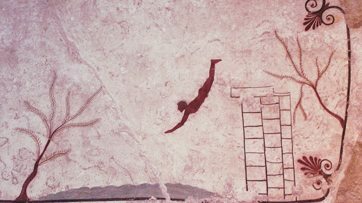 Starring exposure vessels, among which are the three pieces of large (more than one meter in height) with red figures that represent a unique way because there were no other findings with similar measures dell’Apulia out. Among them is the loutrophoros, whose crater is only 112 cm with spiral horns decorated with gargoyle heads. Important pre-Roman settlement, with remains dating from the sixth century. BC, in which co-existed Etruscans, Greeks and natives. The Archaeological area was called the “Acropolis” for both the topographic location of the finds is because ‘the structures found suggests a religious center and the Civil summit’ of the settlement. Impressive remains of the Samnite necropolis at the end of the fourth century BC. The “castle” that sits on the hill Bonadies, already occupied in the Roman and then Byzantine fortress, was equipped with a maior Turris, who made “impregnable by nature and art, not being in Italy equipped with a rock over it” (Paul Deacon, in Historia Langobardorum). With Arechi II, who expanded the territory of the city to the east and west walls surrounding it to new, well-handed from the illustrations accompanying the poem by Pietro da Eboli, Liber ad honorem Augusti, the end of the twelfth century, the castle became a symbol of the centrality of his principality. Gisulf II, the last Lombard prince of Salerno, coined the famous coin with the legend “Affluent Salernu” mirror iconography of the city, dominated by Turris, before he became, in 1077, a fortress Norman, directed by Robert Guiscard. He later became an important defensive element aragonese chessboard, and then progressively lose importance with the changing techniques of warfare. It was completely abandoned in the nineteenth century. The restoration of the castle and the Bastille, which started in 1982, led to functional recovery of the architectural components and the entire redevelopment area, aiming, first, to refund the readability of the largest architectural qualities of the fortified structure, subject to continual expansion and adjustments dictated by the succession of governments in the historical period of its defensive function and by the emergence of new military techniques. Today, through link structures, service and advanced security are possible thematic itineraries. Excellence are the Media Gallery, the Museum of the virtual display system with Turris Maior and the Bastille, which is home to the contemporary sculptures by Lorenzo Spirit (the “new guards”), attached to the castle through a didactic-naturalistic. Dedicated to S. Matthew the Evangelist, whose relics are still preserved in the crypt, the Cathedral of Salerno has characteristics similar to those of the Abbey of Monte Cassino situated Desire: plan of a basilica consists of three longitudinal aisles, a transept and a four. The original structure, built under the reign of Robert Guiscard, was renovated in 1688. Preceded by a huge atrium surrounded by a porch supported by twenty-eight columns, than the imposing building on the south side has a big tower of the twelfth century. Access to the structure is through a door set in a bronze Byzantine marble portal at the base which is placed a pair of lions. The church of San Pietro a Corte, known as the nail head tippet founded from prince Arechi II, in around 787, is today the complex of greater importance of the historical centre of Salerno. Archaeological surveying currently in course, has brought to light the Roman area. The area comprises, beyond the atmospheres immediately below, once occupied by shops, also the area pertaining to confraternity of S. Anna. In the XIII century the church was used as a meeting centrefor the Parliament: in it public ceremonies were often celebrated, between which the bestowal of the diplomas of the Medical School Salernitan. The first document mentioning the church of Santa Maria de Lamas dates from 1055: “ubi ecclesia sancte Marie Blade … constructa intus hanc dicitur salernitanam civitatem”, but probably originated more ‘old. Santa Maria de Lamas, located in the heart of the historic city ‘, contains the only evidence of the Lombard period of Salerno. Inside, two columns are decorated with frescoes almost life-size: about one and ‘represented the Christ with the cross, on the other there’ a female figure, perhaps Mary Magdalene. The Baptistery, whose circular shape, he was awarded the title of “Round”, was part of a larger complex. The first written attestation dates back to a diploma of the year 841 AD Set of 15 arches, supported by many pairs of smooth columns, the dome covering the central baptismal font, octagonal, second only to that of Italy in San Giovanni in the elements Laterano.The marble of the architectural decoration, bases, shafts of columns, capitals and molded frames are bare and evident function of reuse. Built in the second century BC and scenically set against the southern wall, was enlarged from 76 to 96 m in the Augustan age or Tiberian. It is one of the greatest scenic buildings of ancient Campania. Both the orchestra and the frons scaenae were adorned with precious marble and statues. Underwent further restoration after the earthquake of 62 AD. Avellino Castle stands on a volcanic outcrop in ancient surrounded by two streams, north and south on the Rio Striper Cupo. Recent archaeological investigations have identified the original core of the complex, to defend the medieval city situated on the hill of earth, and in use until at least 700, a time when the last owner, the Caracciolo princes, they left the ‘ancient manor, preferring a stately residence more suited to the needs. Interventions, ongoing project carried out on the town of Avellino, the BAP Superintendent of Salerno and Avellino and the Superintendence of Archaeological Heritage of Salerno and Avellino, held a view of the preservation and enjoyment of the complex. is a well documented next step between high and late Middle Ages during which new structures are implanted substantially constituted by a rectangular fortress. Around the thirteenth century, the monument is affected by significant renovations and expansions, among which deserves particular mention of the construction of a church. More accommodations that occurred around the fifteenth century, followed by a series of destructive episodes, including a fire of which traces were found on the floor of a rectangular room. The castle lost its residential function in the first decade of the ‘700 and the complex, over 800, is used as a quarry and agricultural purposes, according to a feature found in other similar contexts. The Museum is housed in the Convent of St. Francis, founded in the thirteenth century and extensively remodeled in the sixteenth. Before the Second World War was used as the town hall, the district court and the local high school. The bombing of the war caused its partial destruction and abandonment. A recent restoration has returned to public use and the entire west wing of the complex is made available by the Municipal Administration of the Archaeological Superintendence of Salerno and Avellino, who oversaw the preparation of the Archaeological Museum. Currently, the Museum collects artifacts, mostly tombs, from the old town of Eboli, which because of its location in the coastal plain at the mouth of major routes such as the natural river valley and the path of Tusciano Ofanto-Sele, represents the age a boundary between ancient territories participating in different cultures. The exhibition is organized chronologically tended to present the main stages of life than thousand of the settlement: prehistory, the Iron Age, the oriental period, the sixth and fifth centuries, and, for now, ends with the rich documentation of the fourth century. B.C. By its nature it will be surfed for a museum in the near future to accommodate even the testimony of the territories bordering on the middle course of the gravitating Sele. But it should be noted that this particular museum, created to tell the story of a former district is not culturally homogenous, will feed and grow with the results of field research, which is why the exhibition, the ‘upper floors is still under construction , will become dialectically linked to the archaeological investigation and the subsequent reconstruction of the ancient landscape. In the lobby there is the base of a statue with an inscription (183 AD) known as Tombstone Eburina, which had been reused in the bell tower of the church of Santa Maria in Intra. This epigraphic text makes it clear that had the status of Municipium Eburum. The construction of the new National Archaeological Museum of Pontecagnano – funded by the Ministry of Heritage and Culture with the contribution and participation in the Campania Region and the local municipal government – is the final stage of an ambitious project led by the Superintendence for Archaeological Heritage the provinces of Salerno and Avellino in close collaboration with the University of Naples ‘L’Orientale’ and with the University of Salerno, and configures itself within the exceptional importance of the archaeological heritage as it gathers the most significant Etruscan expansion in southern Italy, returned from one of the most important site of ancient Campania and the South. The new and larger premises in a strictly scientific, but shows at the same time charming and attractive, through the development of various issues, the results of the intense and constant research begun in 1964 in the municipality of Pontecagnano (SA) following the discovery of The most significant of the last fifty years, a large Etruscan settlement, which had urban characteristics as early as the Archaic. The importance and the size of the site are documented by the rich more than 8000 funeral that attest the attendance of the First Iron Age (end of X – the early ninth century. BC) to Roman times, when the settlement Etruscan-Italic overlaps Picentia colony (263 BC). The main core of museum display is made up of princely outfits oriental period (late eighth-seventh century BC. ), at the peak flowering of the center. It hosts a rich documentation of the entire province of Salerno, from prehistory to late antiquity. In pole position is the support of the princely tomb of Roscigno, V and the beginning of the end of the fourth century. BC. It preserves also ceramic bells, and Samnite age of Lucan ‘Hellenistic, Etruscan pottery, bronze ornaments including the admirable head of Apollo discovered in the waters of the Gulf of Salerno. This is a valuable late Hellenistic original, dated in the first half of the century. BC, attributed Pasiteles artist, born in Magna Graecia. Palazzo Pinto, aristocratic residence in the heart of the historic center, houses the Provincial Art Gallery. On display are paintings from the Renaissance to the early twentieth century. In the Renaissance section of the boards are fine by Andrea Salerno and the Master of the Coronation of Eboli. Of great interest are the seventeenth-century paintings by Giovanni Battista Caracciolo, Andrea de Lyon, Charles Rose. The eighteenth century are paintings by Francesco Solimena and his Academy. Many paintings by painters costaioli Salerno and in the second half of the twentieth century. One section is devoted to foreign artists, who built the works exhibited here. The This accommodation reflects the type of the villa maritima has two floors with large reception rooms, then split into smaller rooms (in ¹ area west) and thermal environments (in ¹ eastern area), which are still recognizable tepidarium, the caldarium and praefurnium . The upper floor, built later, are still a few elements that are not clearly legible, including the stairway on the west side. The lower floor is rather well preserved. Its facilities rely on the hill behind, doing so also a static function, terracing, for the higher ones. 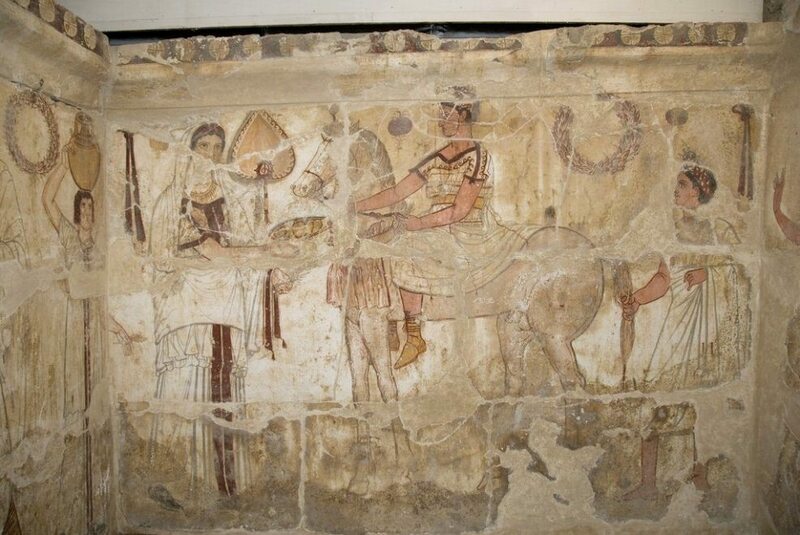 In some areas the decoration is kept in a third style of stucco and the times they are arranged around a large triclinium with nymphaeum (about 70 square meters), with a ceiling decorated with stucco ceilings and patterned ground and the remains of frescoes in the IV style, with beautiful mosaic floors. Built in the early 1 century AD, the villa, her life has undergone several renovations and remodeling. The ancient Roman colony of Abellinum, situated on the hill of today’s city of Civita Atripalda (AV), along the left bank of the Sabbath, is rich in testimony monumental, related to the original plant. The urban fabric, which covers about 25 hectares, is divided by orthogonal roads that mark the districts and is enclosed by massive walls in opus reticulatum 2 km long, dating back to the late Republican. A rich mansion, a domus type Pompeian atrium and peristyle, with painted plaster and mosaic floors, occupies an entire city block. Excavations are currently underway, have allowed the highlighted area of the vestibule of the domus: in particular it was found the entrance flanked on each side by two large tabernae (shops), marked by two stone thresholds, overlooking a stretch of great decumanus (east-west). Structures relevant to a thermal plant, particularly monumentality and texture, the character of public testimony, already evident from a number of important discoveries, including that of the sacrificial altar with marble. Outside the urban areas are located burial along the banks of the Sabbath, and the remains of the monumental amphitheater. Accommodates most part Vietri ceramics, but also from other sites in Campania, Apulia, Calabria, Liguria. The oldest specimens of Vietri ceramics dating from the late century. XV. This production is part of a trend that involves the working of Salerno and its immediate surroundings since the pre-Roman times. Go back to the seventeenth century the oldest examples of votive tiles. Rich is the testimony of the twenties and forties, the period known as “German”, with pieces from authors of northern Europe made in Vietri.